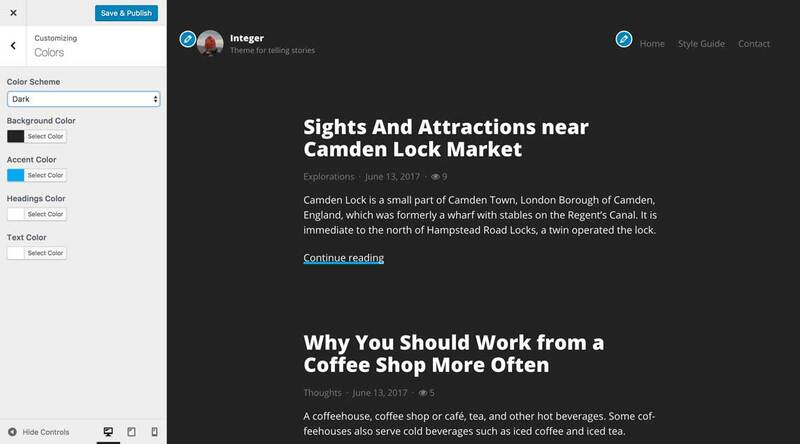 Integer is a minimal blogging WordPress theme. Writing a tutorial, travel diary, or an interview? Integer has you covered. 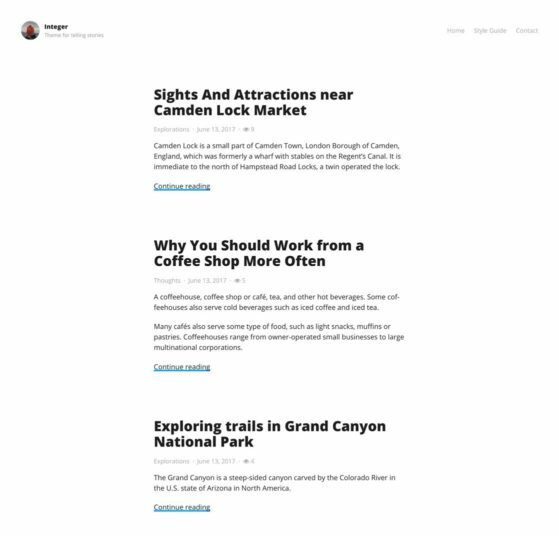 Integer is a minimal blogging theme designed to tell your stories. 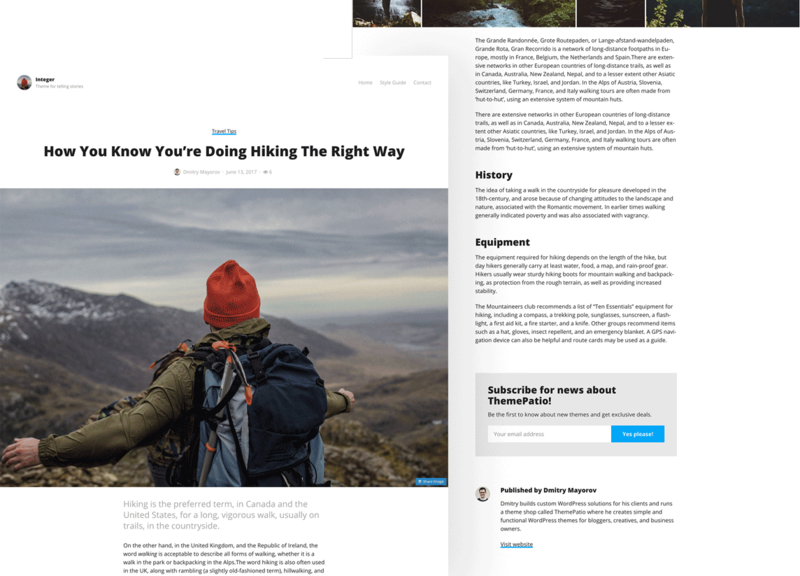 Full-width images, great typography, newsletter subscription forms, and many other subtle but useful features will help you reach your blogging goals with style. 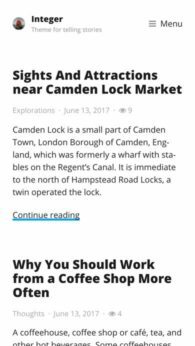 Integer features a blog layout that can be customized to display posts in a single column or a grid view. Single post template is where Integer really shines. 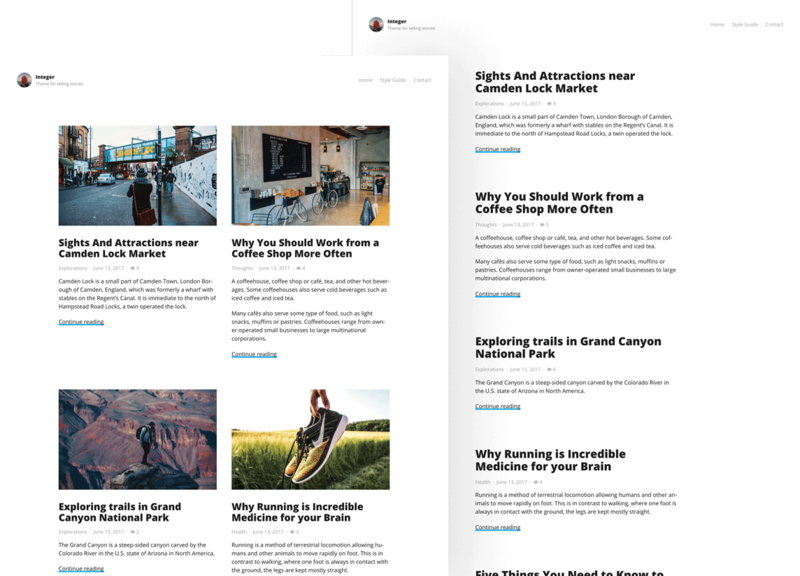 Every detail on this page including the title, post meta, screen-wide thumbnail, subscription form is designed to tell your story in a most engaging way. Set custom colors for the text, headings, links, and background. Choose one of the predefined schemes or create your own. Yes, your site will look great on any device and screen. Can I Install this theme on multiple sites? Yes. You can use this theme on as many websites as you want. Can I use this theme for a client website? Absolutely. You can use this theme to create a website for your client. Can I translate the theme to my language? Yes, every theme comes with a .pot localization file, so you can translate your theme using software like Poedit. One year of support is offered with every theme. It includes answering the setup questions, questions about the theme functionality, and bug fixing. What happens after the year of support runs out? Your theme will still work but you'll need to renew the license to be able to use support and install theme updates. Renewal is offered at a 30% discount from the original price of the theme. Under what licence ThemePatio themes are released? All ThemePatio themes are released under GPLv2 (or later). Just like WordPress. Yes. If you are not satisfied with the theme let us know within 14 days of purchase, and you'll get a refund. Integer comes with a license key that grants you a year of support and theme updates. This means you won’t be left on your own if you have questions about the theme. And after the year runs out you’ll be able to renew the license with a 30% discount.